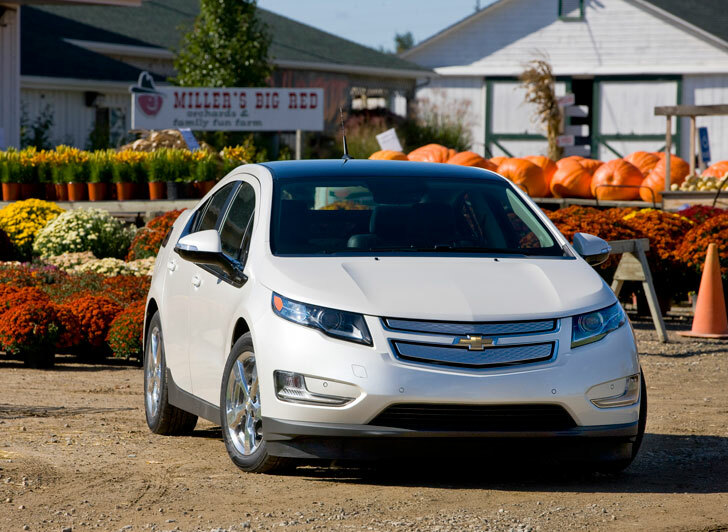 We were pretty sure that the Republican party was all for American-made cars and the American jobs they create, but we must be wrong because they’ve recently begun an all-out war on the American-made plug-in hybrid electric Chevy Volt. It started with Newt Gingrich saying that you couldn’t put a gun rack on it — even though you can put a gun rack in it, not that you should– and now has progressed into this adorable video where some GOPers attempt to demonize the innovative vehicle, the car company that created it — General Motors, which recently reclaimed its spot as the #1 car company in the world — and the President’s support for all of the above. See the GOP’s attempt at “going viral” after the jump. It seems the Republican distaste for the vehicle, which saves its owners cash at the pump and could help to reduce our dependence on risky foreign oil (two things the GOP seem to be bashing the President for not caring about), comes from the government bailout of General Motors in the early months of the recession, which President George W. Bush initiated and President Obama expanded. Funny, though, that they didn’t choose to pick their fight with GM’s best selling car, the Silverado pickup truck, which if used correctly, can clock in at an impressive 10 mpg combined fuel efficiency rating. In addition to the confusion behind why exactly the entirety of Republicans in elected office — except for our favorite elephant, New York Mayor Michael Bloomberg — seem to hate all things green even if they save people a boatload of cash, we’d like to point out some fun things in the video that seem amiss. The slogan for Obama/Volt 2012 (because that’s what this whole thing is about, they want the President to pick a car as his running mate, isn’t that funny?) basically already belongs to someone who is actually funny. The Obama/Volt 2012 campaign slogan, “Building a better tomorrow…tomorrow” is eerily similar to the slogan for the Colbert Super PAC, which was started by talk show host Stephen Colbert to wreak hilarious havoc on the 2012 Presidential campaign. The Colber Super PAC’s motto is “Making a better tomorrow…tomorrow.” We checked to see who registered the ObamaVolt2012.com domain name but they’re listed as private, so it is possible that Colbert is behind this, but judging by the weak attempt at humor we’re going to say he’s not. The video also says that the Volt is made in China. Some of them are, but only the models that are to be sold in China. US models are made by American workers mainly in the Detroit/Hamtramck Assembly plant, which was recently revived and has put American auto workers back on the assembly line. It’s true that some of the large parts are made overseas, but not in China. The gasoline motor is made in Austria and the battery in South Korea, but production of the latter will soon move to the US as a $303 million battery plant is being built in Holland, Michigan. So, if whoever is behind this wants to keep getting their facts wrong, that’s fine with us, we’ll keep correcting them. I drive a Leaf. I've also changed all of the lights in my house to LED. I am also an NRA certified instructor for rifles and shotguns and should carry guns in my car. NRA instructors are used to teach most law enforcement agencies. The problem with the Volt was the lapse in time from when the batteries caught fire and it was reported to the public by the government. It appeared that the the current administration was hiding dangerous information from the consumers to protect their investment. I agree that America needs to reduce our dependency on foreign oil and that we have the technology to take us there, but I don't agree with the methods being imposed by the current administration. If a person needs to lose weight, cutting off a leg would met that objective but is ill advised. We are currently in a depressed economy with a lot of people out of work. Overpricing and cutting off our energy supply without a viable replacement will only cripple our nation. Consumers should be aware of products that are dangerous as soon as those dangers are known. Sweeping this information under the rug only served to increase the distrust in our government and in the positive moves that we are making with our technology. The bail out of Solyndra did not help matters either. I remember a time not to long ago when only the left would demonize an American corporation and only the right would defend it. Times have changed. Wow- so not funny. I just want to hide my eyes I'm so embarrassed by this pathetic attempt at humor or satire, or whatever it is this video is trying to accomplish. Thank you for posting about this and breaking it apart line by line. Personally I don't think the ad is effectively negative and ending it with the obama logo makes me come away with an unrelated positive feeling for obama. We were pretty sure that the Republican party was all for American-made cars and the American jobs they create, but we must be wrong because they've recently begun an all-out war on the American-made plug-in hybrid electric Chevy Volt. It started with Newt Gingrich saying that you couldn't put a gun rack on it -- even though you can put a gun rack in it, not that you should-- and now has progressed into this adorable video where some GOPers attempt to demonize the innovative vehicle, the car company that created it -- General Motors, which recently reclaimed its spot as the #1 car company in the world -- and the President's support for all of the above. See the GOP's attempt at "going viral" after the jump.